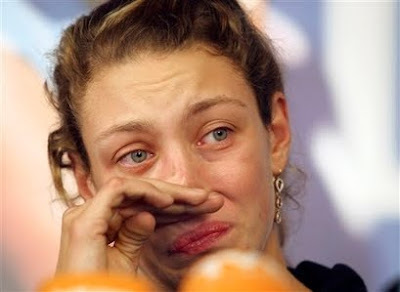 A teary Yanina Wickmayer held a presser today saying that she has never tested positive for drugs. The Belgian was suspended last week by the ITF for failing three times to report her whereabouts for testing. She complained that tennis and anti-doping authorities did nothing to educate her about how to report her whereabouts online as required by international anti-doping rules. However, it was unsure whether Wickmayer will appeal her one-year ban or accept the ruling. Updates: Based on the original transcript from Wickmayer presser, she will indeed make an appeal and fight to clear her name. The report by AP here is not entirely accurate.